This July 15, 2018, file photo shows Young Thug attend FREQ NYC in New York City. Rapper Young Thug, the featured rapper on Camila Cabello's hit song "Havana," was arrested on a gun possession charge Thursday night at his own birthday party, held at a Dave & Buster's in the Hollywood & Highland shopping mall in the heart of Hollywood. A cellphone video posted to social media appears to show Jeffery Lamar Williams, popularly known as Young Thug, being escorted out of the Dave & Buster's by officers with the Los Angeles Police Department. The video also shows LAPD carrying a large bag of cash as evidence and a white Rolls Royce taped off with yellow tape. LAPD media relations confirmed that guns were found at the scene, but it's not known exactly where. Highland Avenue was blocked as dozens of officers investigated at the party. An LAPD airship was seen overhead and several other people were also arrested at the scene. 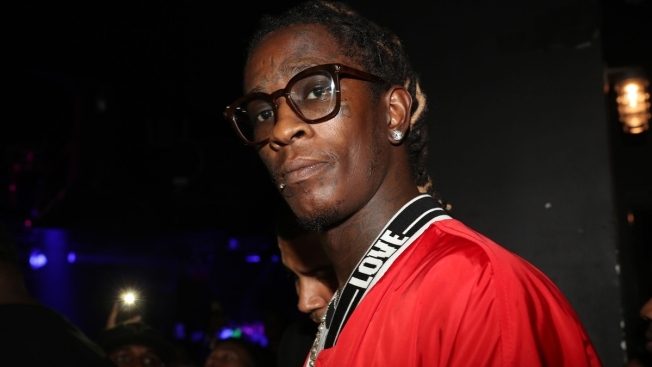 Young Thug, an Atlanta rapper behind songs like "Liger" and "Relationship," had announced on Instagram and Twitter that he was celebrating the release of his album "Slime Language" with a listening party at the Dave & Buster's. He was arrested on suspicion of possession of a concealed firearm in a vehicle and is being held on $35,000 bond, according to LAPD Officer Drake Madison. NBC LA is reaching out to his team for comment.